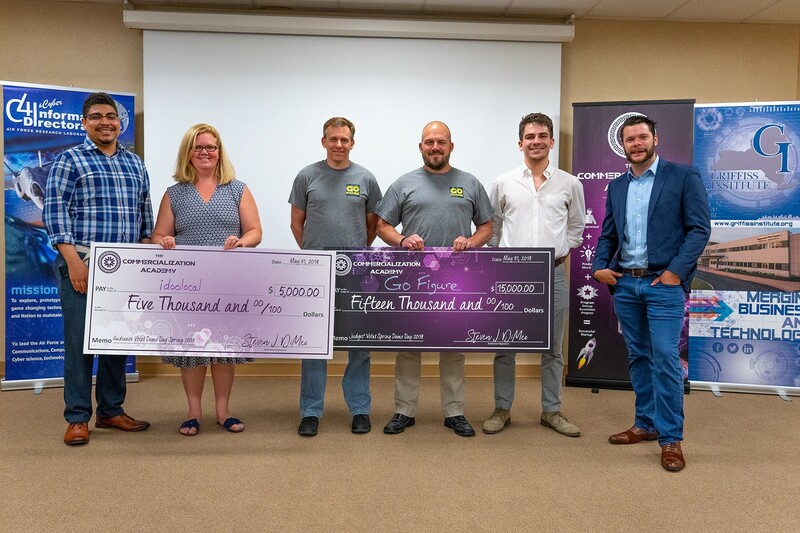 Go Figure and idoolocal Win the Spring 2018 AFRL Commercialization Academy Demo Day! All the teams in the cohort are to be congratulated for their hard work and dedication in preparing for Demo Day. We'd also like to thank the following generous supporters for making the 2018 Spring AFRL Commercialization Academy Cohort and Demo Day possible: Oneida County Industrial Development Agency, NYSTEC, The Community Foundation of Herkimer & Oneida Counties, Rome Industrial Development Corporation, M&T Bank, InfluenceLogic, Community Bank, Mohawk Valley EDGE. Left to right: Gabriel Pendleton, AudioStaq co-founder; Audience Vote winner, Emily Call, idoolocal co-founder; Judges’ Panel Winners, Go Figure CEO, Justin Call and Michael Leonard, Head of Customer Care at Go Figure; Terren Klein, Pulse co-founder; and Chris Martin, Off the Cuff founder. Photo by Simon Eisenbach Productions.